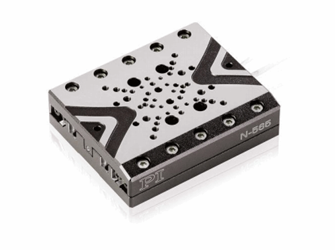 The N-565 features ultra-precise 2 nm minimum incremental motion and a direct-measuring PIOne encoder with 0.5 nm resolution. The stage is self-locking when switched off which saves on energy and reduces heat generation. The optical, non-contact PIOne encoders measure the actual position directly at the motion platform with the highest accuracy so that nonlinearity, mechanical play, or elastic deformation have no influence on position measuring. Download the datasheet for more information on this stage’s NEXACT® PiezoWalk® technology, encoders and crossed roller bearings, as well as other specifications and features.